Great Item . Have purchased before. Plumber agrees! With clean lines and sturdy construction, Kraus bathroom accessories provide everyday efficiency with style. Constructed from brass, the pop-up drain is designed to work with any above-counter vessel sink with overflow. For easy installation, all required rubber gaskets are included. Choose from four distinctive finishes to match your bathroom faucet and create a beautifully coordinated look. Dimensions 10.0 In. X 3.0 In. X 3.0 In. I would love to give this 5 stars all around because it looks really nice (got it in Satin Nickel), but there are two cons to this drain. First, it seems to really splatter all around when the water hits it, and I didn't have that issue with the drain it replaced; and secondly, because of the way it's shaped (with a slightly curved top), some water 'hangs' around the edge of it - it doesn't completely run off, and that leaves a film, so it really has to be cleaned to get rid of that film. Kind of a pain. Not sure I would recommend - if there was a "Maybe" option, I would have marked that one. Overall, it seems to be really good quality, I just wish the water came off it easier and didn't leave that film around the edge. I purchased 3 of these drains for my master bath renovation after I had bought one for a guest bath 8 years ago. They are beautiful to see, easy to use and clean. The finish doesn't speckle or dull after 8 years of use. A tap of the drain opens and closes it so wet hands don't drip water outside the bowl when opening the drain I love this product . 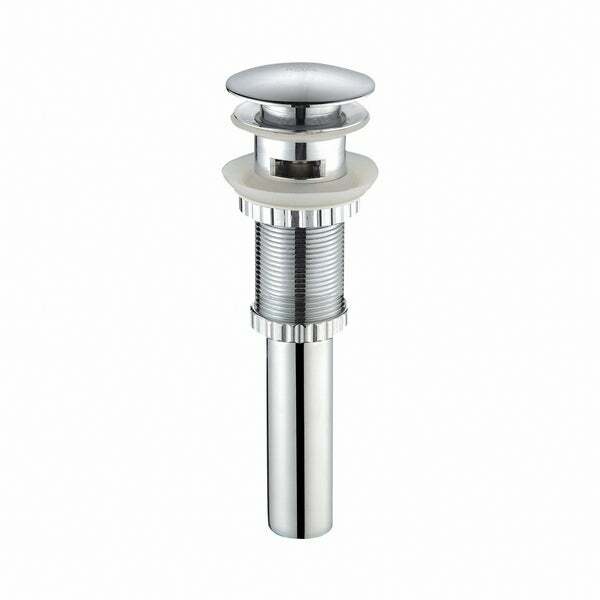 We have used 4 of these in our home and they are top notch quality pieces for both traditional sink and vessel sinks. Make sure you order the appropriate drain (with or without overflow and order matching ring for vessel sinks). Overall very very happy with every one we purchased. Install required a little work to match drain trap height as the drains provide good length for all applications. Love these drains. They are solid. We have installed in all of our bathroom sinks. You just can't go wrong with Kraus for quality and value! Love it Pop up drains are so nice. No levers to mess with. These drains are great. We bought them to fit into vessel sinks also bought on overstock.com, and they work perfectly. The only issue we had is that we were originally sent drains without an overflow, and the sinks required an overflow. So we're out the $60-something we paid for the original wrong drains. Other than that, they installed very nicely. Even our plumber, who had never heard of Kraus, was impressed. It's a beautiful addition to a larger vessel sink or integrated glass top sink. Fantastic appearance, quality and value. Installation was easy and leak-free. I expect I'll get many years of use out of this beauty! Be sure to check whether you need the model that doesn't have overflow. This one is for vessel type sinks which as a rule do NOT have an overflow hole. Nice design. easy to install. Works well with sink. Nice drain stopper for a vessel sink. Easy to install and fits nicely. Works and looks great with my vessel sink. You can't go wrong by ordering this product. As usual O came through. Can a drain plug be beautiful ? We are in the middle of a remodel , and I got a frantic call from the plumber that I had neglected to buy drain plugs . As we live a couple of hours away , I had him describe EXACTLY what I should get , and immediately went on line to Overstock. These drain plugs arrived in a couple of days [ I had them shipped to the new condo ] , and were installed by the time we saw them ... They are BEAUTIFUL ... They cover the whole drain , including the ring underneath , so all you see is the plug . I love the smooth satin sheen , and the nice dome shape... Thanks again , Overstock ! This was recommended for the Sinkology Hobbes 19" hand crafted hammered nickel vessel sink. Unfortunately, it was the wrong drain, because it had a the overflow in the wrong place for the sink. So don't purchase this with the sink listed above! This pop up drain is great. It's sturdy and looks like it will hold up well. It looks great with the finish on the faucet and hold the water in the sink well. I rated this a 4 star because it is the wrong size for the sink I purchased. Overstock's "purchased with this" indicated that it goes with the sink I purchased, but unfortunately, it does not. I purchased a hammered nickel sink and this fits the opening on top, but the mountings underneath are too small to install in the sink properly. The quality of Kraus fittings is superb, but this does not fit the sink it was intended for---as was indicated by Overstock. My advice: order the sink then ask your plumber the proper size for the stopper. Very nice drain I have never had a pop up before. Feels like nice quality. I would recommend to others. Nice, shiny drain plug. Pop-up screws off for cleaning the drain. I'm very happy with this product. Perfect fit for my vessel sink. "Which kraus pop up drain works with an undermount sink with overflow. One of your items references an item that only works with vessel sinks. Help!" "I purchased this product however the length is too short to mount on the vessel sink with a granite countertop that I currently own. How can I purchase a longer attachment for the bottom so that it can be attach to the drain?" You can buy an extension for it at ****** . I assume your drain (elbow) is what you mean by drain. Talk to the people there and they can tell what you need. It is very easy. "I bought a undermount High Point petite sink with overflow. Will this pop up drain work? I'm getting the impression this is meant for a vessel sink not traditional undermount." This pop up drain will not work with an under mount sink. It is designed for vessel sinks. "I want to buy the Typhon Faucet which apparently does not have the metal rod thing on the back. (Don't want it anyway) And I would like a "push-button" type drain. But I have a "Regular" sink with an overflow hole, NOT a Vessel sink. Will this "push-button" drain work in my sink?" "how do I know if I need a plain pop up drain or one with overflow? there is an overflow hole in my undermount sink on the front wall, if that helps"
Hello symphx, If you have an overflow you would just need a regular pop up drain so when you pull the drain that is on the faucet it will pull the pop up drain open or closed. This drain you would just push up or down to close it. I hope this makes sense. Thank you for shopping with us! "would this drain fit a 1.5 sink hole?" Hello selena28, thank you for your interest in the Kraus Pop Up Drain with Overflow. This fits any standard 1.75 inches opening installation. Thank you for shopping with us.